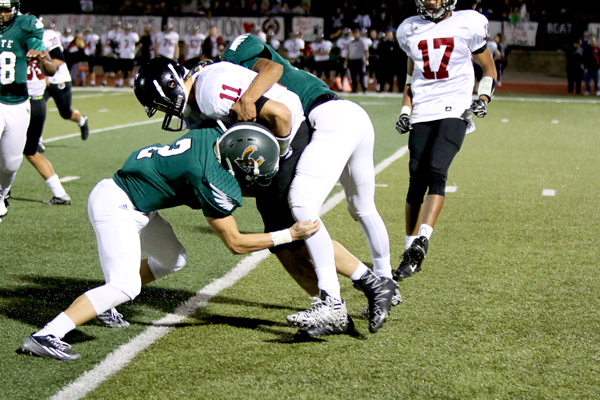 On a chilly Friday night, two powerhouse schools collided in one packed stadium and the result was not pretty, Free State smacked Lawrence High, 56-7. For Lawrence High, they can look at the game in two different aspects, a glass half full or half empty if you will: Lawrence gave up only 14 points in the second half against Free State; but they did give up a whooping 42 in the first. The biggest take-a-way was their defensive struggles against the big play: busted coverages, missed tackles and momentum-killing penalties doomed this unit from the first play of the game. Lawrence’s offense moved the ball with a bruising ground game that rushed for 217 yards, with the likes of seniors Trey Moore (158 yards, touchdown) and James Reeder (64 rush yards) leading the charge but struggled to throw the football. The Lions threw for just 54 yards at two passing yard per clip with zero touchdowns and a pick. The rivalry game was chippy to the say the least: at least a half-dozen un-sportsman like conduct penalties, hard-hits, pushing, shoving and even an ejection throughout the game. Lawrence High will look to rebound heading into the playoffs while Lawrence Free State will play Wichita South.